Writing something about The Artist proved to be a fairly difficult task. It is a film that I honestly didn’t believe would ever be made. Unlike the vast majority of movies being produced nowadays, it hadn’t sacrificed style and substance in favour of financial pursuits. The biggest Hollywood name is John Goodman, it is predominantly silent, and filmed in black and white. It hardly caters to the 21st century film goer’s usual tastes. It has, of course, turned out to be a bigger hit than many would have anticipated, receiving critical acclaim and positive feedback from audiences. 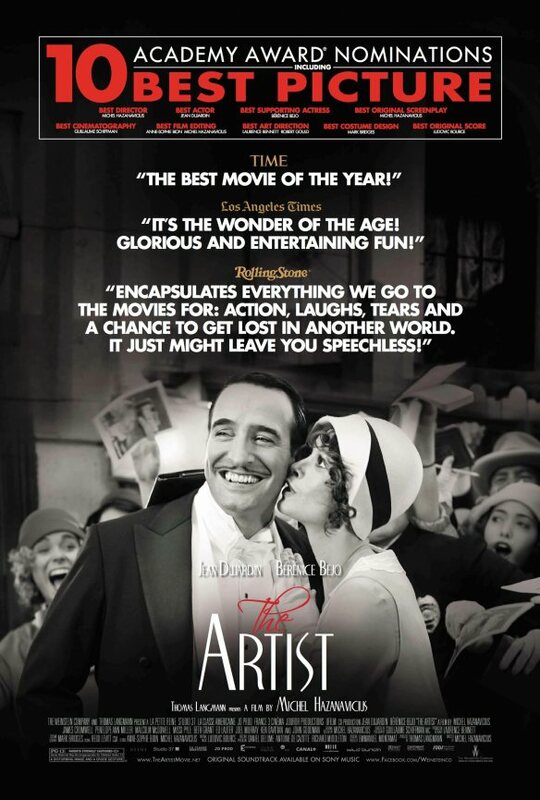 The Artist was born out of director Michel Hazanavicius’ interest in the films of the 20s and 30s and his long-standing desire to play with this historic genre. It is easily (at least in my opinion) compared to James Cameron’s Avatar, which was solely used as a method to highlight the possibilities of 3d technology. When Avatar was first released in 2009 it was as a celebration of the modern age of cinema and technological advancements. For all intents and purposes, The Artist is the exact opposite. Filmed in traditional 1.33 aspect ratio in black and white, The Artist uses very little sound and relies instead on its beautiful musical score and the occasional intertitle. It looks back to a golden age of cinema but in a thoroughly modern manner. Hazanavicius spent months researching the era and silent movie filming techniques before he started creating his masterpiece. It is superbly thought out and put together. We are not watching a film that tries to pass itself off as a film of the 1920s but instead a historically accurate homage to that era. On a visual level the film never falters. The black and white world of 1920s Hollywood is consistently beautiful and provides the perfect setting for the cast to do their job. The audience is reminded of a time when it was the all important close-up of an actor’s face that told the story. The pressure was on Hazanavicius to create a film where the image is everything and it’s a challenge he was more than ready for. If there is anything that lets this film down it’s the story itself. We are dealing with a plot that is fairly pedestrian. Coming from a similar place as films like A Star Is Born and Singing in the Rain, the main character finds himself dealing with the transition from silent film to talkies. The film begins in the upbeat and joyful world of silent movies. Hollywood’s darling, George Valentin, is so set in his ways that he refuses to believe talking pictures are anything to be concerned about. The same cannot be said for plucky young actress Peppy Miller who quickly finds herself reaching the dizzying heights of stardom within this new era. Of course her climb to the top comes at the expense of the old crowd and performers like George find themselves in a less properous position. Of course this fairly unoriginal plot is really uplifted thanks to the great work of the lead actors and their director. Dujardin gives a truly fabulous performance as George Valentin, a silent star who finds himself lost in a world where sound is everything. He is the true star of the entire piece. Aided of course by his co-star Bérénice Bejo who proves to be one of the key ingredients in blending Hazanavicius’ vision with Dujardin’s homage to the likes of Rudolph Valentino and John Gilbert. The chemistry between Bejo and Dujardin is palpable. Hazanavicius’s film is a celebration of everything cinema was and could be again. As the film is predominantly silent it undoubtedly takes George’s side in suggesting that silence is art. Of course, it would be a bit of a stretch to say that Hazanavicius is trying to tell his audience that good films must be made according to the standards of the 1920s. However, The Artist makes a refreshing change and proves that filmmakers do not need to rely on CGI and other distractions to wow an audience. It’s an absolute masterpiece.